Systemic administration of Janus kinase inhibitors (JAKis) is associated with adverse events, including serious infections, malignancy, and herpes zoster (HZ). Herein, we report a case of a 17-year-old male with alopecia universalis who developed suspected HZ-associated encephalitis (HZAE) during treatment with oral tofacitinib. Oral tofacitinib was immediately discontinued, and the patient was started on antiviral treatment. We present this case to highlight a serious complication that can arise with oral JAKi therapy. Physicians should have a high index of clinical suspicion for HZAE in any patient presenting with a vesicular rash and concomitant neurologic impairments while systemically immunosuppressed. Tofacitinib, a small-molecule Janus kinase (JAK) inhibitor (JAKi), was first approved for the treatment of rheumatoid arthritis in 2012 and later psoriatic arthritis in 2017. Tofacitinib is a JAK1/JAK3 inhibitor that attenuates the immune response, specifically T-cell-mediated inflammation through the downregulation of several inflammatory cytokines. Tofacitinib has been used off-label to treat of alopecia areata (AA), with systemic formulations demonstrating promising results. JAKi are associated with an increased risk of infection. In particular, tofacitinib has been associated with serious infections in 2%–6% of patients, malignancy in 1%–3%, and herpes zoster (HZ) in 1%–3%. Reactivation of varicella-zoster virus (VZV), known clinically as HZ or shingles, is associated with decreased VZV-specific cell-mediated immunity seen with advanced age (8-fold to 10-fold increased incidence in patients over 60 years) or immunosuppression (i.e., HIV/AIDS, bone marrow transplant, and iatrogenic systemic immunosuppression). After primary infection, VZV remains latent in ganglionic neurons; upon reactivation, VZV travels anterograde to the skin, causing the hallmark dermatomal, vesicular rash. VZV can also travel retrograde, causing neurologic complications including encephalitis, meningitis, myelitis, optic neuritis, and stroke. A 17-year-old male with a 10-year history of AA progressing to alopecia universalis, with eyebrow and eyelash involvement, was started on oral tofacitinib 5 mg twice daily. The patient initially demonstrated successful therapeutic response with complete regrowth after JAKi initiation. Five months after starting tofacitinib, the patient presented to his family physician with painful, erythematous vesicles localized to the left chest wall in a dermatomal distribution associated with fever, malaise, new-onset severe headache, generalized weakness, mild cognitive impairment, confusion, somnolence, psychomotor agitation, and new-onset paresthesias of his hands and feet. The diagnosis of HZ with complications was made, and he received oral valacyclovir 1000 mg three times a day for 7 days with instructions to go to the emergency department if symptoms worsened; a spinal tap was not performed. Oral tofacitinib was immediately discontinued. After antiviral treatment, the patient's symptoms gradually improved to resolution without sequelae. Oral tofacitinib was restarted; however, the patient started to lose hair and continued despite increasing tofacitinib dose; after 2 months without clinical response, JAKi was discontinued [Figure 1]. HZ is a known adverse event secondary to immunosuppression with oral JAKis. In particular, patients taking tofacitinib 10 mg twice daily (vs. 5 mg twice daily), those of Asian race (Japanese and Korean), older age, and those with prior biologic use are at increased risk. Furthermore, increased risk of developing HZ is well documented in patients with autoimmune diseases, including AA, and is likely secondary to the use of systemic immunosuppressive medications. Although HZ is usually self-limited, in rare cases and in the setting of immunosuppression, disseminated HZ can occur leading to complications including encephalitis and even death. 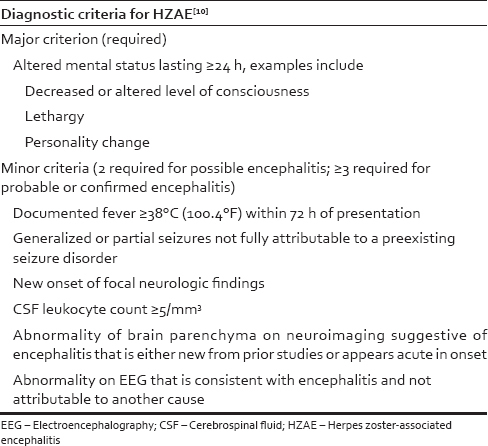 Clinical diagnosis of HZ-associated encephalitis (HZAE) is made based on the presence of the characteristic HZ rash and symptoms of encephalitis (including but not limited to fever, malaise, headache, and cognitive impairment) [Table 1]. Patients usually present with delirium days after the outbreak of a vesicular rash, but symptoms may occur before the rash, up to 6 months after, or even in the absence of the classic dermatomal rash (zoster sine herpete). Encephalitis due to VZV is characterized by concomitant vasculopathy affecting either large or small vessels. Large-vessel disease (granulomatous arteritis) is seen in immunocompetent hosts, whereas small-vessel disease is commonly found in the setting of immunodeficiency. Complications of HZAE include intracerebral hemorrhage and stroke. Table 1: Diagnostic criteria for herpes zoster-associated encephalitis, adapted from Venkatesan et al. HZAE has been reported with the use of oral tofacitinib in another case. A 51-year-old Caucasian male in an ulcerative colitis clinical trial developed HZAE after taking tofacitinib 10 mg twice daily for over 2 years. Tofacitinib was permanently discontinued, and the patient was treated with intravenous acyclovir, followed by oral valacyclovir. Symptoms resolved and there were no reported sequelae. The patient discussed in this report matched diagnostic criteria for possible encephalitis: (1) The presence of altered mental status for more than 24 h with no alternative cause identified (major criterion), (2) documented fever, and (3) new-onset neurologic findings (two minor criteria). He did not present with seizures, and diagnostic tests such as spinal tap, electroencephalography, or brain imaging were not performed. Abnormalities in any of the aforementioned tests would have resulted in three or more positive minor criteria, which qualify as probable or confirmed encephalitis. As brain computed tomography (CT) imaging is often unremarkable in HZAE, the best diagnostic test is polymerase chain reaction identification of VZV in cerebrospinal fluid. First-line treatment of HZAE includes prompt discontinuation of systemic immunosuppression, if applicable, and intravenous acyclovir should be administered as early as possible to prevent long-term neurologic sequelae. Oral JAKi therapy may be associated with HZ skin lesions accompanied by systemic neurologic symptoms, which can clinically present as encephalitis. Given the increasing use of systemic JAKi in dermatology, physicians should be acutely aware of the opportunistic infections associated with systemic immunosuppressive medications, as well as their complications. For patients taking oral JAKi who present with characteristic HZ vesicular lesions and associated central  should suspect HZAE. The authors certify that they have obtained all appropriate patient consent forms. In the form, the patient has given his consent for his images and other clinical information to be reported in the journal. The patient understands that his name and initials will not be published and due efforts will be made to conceal identity, but anonymity cannot be guaranteed. Damsky W, King BA. JAK inhibitors in dermatology: The promise of a new drug class. J Am Acad Dermatol 2017;76:736-44. Liu LY, Craiglow BG, Dai F, King BA. Tofacitinib for the treatment of severe alopecia areata and variants: A study of 90 patients. J Am Acad Dermatol 2017;76:22-8. Kavanaugh A. Real World Results from a Post-Approval Safety Surveillance of Tofacitinib (Xeljanz): Over 3 Year Results from an Ongoing US-Based Rheumatoid Arthritis Registry. ACR Meeting Abstracts. Available from: http://www.acrabstracts.org/abstract/real-world-results-from-a-post-approval-safety-surveillance-of-tofacitinib-xeljanz-over-3-year-results-from-an-ongoing-us-based-rheumatoid-arthritis-registry/. [Last accessed on 2018 Sep 01]. Harnisch JP. Zoster in the elderly: Clinical, immunologic and therapeutic considerations. J Am Geriatr Soc 1984;32:789-93. Nagel MA, Gilden D. Neurological complications of varicella zoster virus reactivation. Curr Opin Neurol 2014;27:356-60. Winthrop KL, Lebwohl M, Cohen AD, Weinberg JM, Tyring SK, Rottinghaus ST, et al. Herpes zoster in psoriasis patients treated with tofacitinib. J Am Acad Dermatol 2017;77:302-9. Becerra JC, Sieber R, Martinetti G, Costa ST, Meylan P, Bernasconi E, et al. Infection of the central nervous system caused by varicella zoster virus reactivation: A retrospective case series study. Int J Infect Dis 2013;17:e529-34. Venkatesan A, Geocadin RG. Diagnosis and management of acute encephalitis: A practical approach. Neurol Clin Pract 2014;4:206-15. PFIZER INC. Tofacitinib (CP-690,550) Ulcerative Colitis FDA Advisory Committee Meeting. PFIZER INC.; 2018. Available from: https://www.fda.gov/downloads/AdvisoryCommittees/CommitteesMeetingMaterials/Drugs/GastrointestinalDrugsAdvisoryCommittee/UCM599514.pdf. [Last accessed on 2018 Sep 01]. Venkatesan A, Tunkel AR, Bloch KC, Lauring AS, Sejvar J, Bitnun A, et al. Case definitions, diagnostic algorithms, and priorities in encephalitis: Consensus statement of the international encephalitis consortium. Clin Infect Dis 2013;57:1114-28.